While everyone wants security in their personal life, one might have never given a thought of having security online. Yes, the contents you browse and the sites you access online can be tracked and monitored, thus breaching your privacy and security. Sharing of important information, downloading contents or making fund transaction online, should be accessed securely so that your private and confidential information and resources could not be exploited by the hackers or snoopers. Be it attackers, crackers, hackers or even our own government, have the capability to track our IP addresses and monitor the content we browse over the internet in our daily lives. Today, more than ever there is a great need to surf the internet anonymously. A recommended solution- Virtual Private Network (VPN). While there are many VPN services which provide security online, choosing the best one for your needs is definitely in your hands. We will review the VPN service provided by NordVPN. A VPN (Virtual Private Network) service hides your original IP address and provides you with different IP address so that you can browse the restricted contents and surf the internet anonymously without revealing your identity, keeping you safe from potential hackers. NordVPN is a VPN provider which offers additional features to ensure you are safe online. NordVPN provides you with the military grade encryption and never keeps user logs. 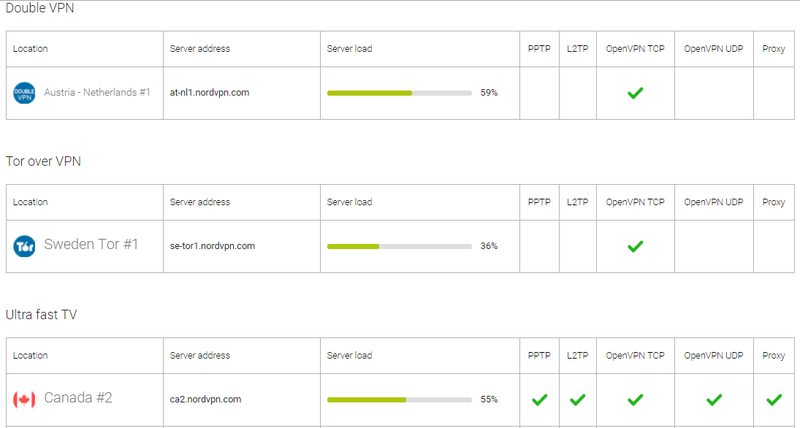 NordVPN is easy to use and runs on multiple platforms such as Windows (xp, vista, 7, 8), Mac OS X, iPhone, iPad, Anroid etc. All you need to do is just download and install it. Double Data Encryption: While other VPN service providers use 128 bit encryption on the data once, NordVPN does it twice to provide you with the tightest security and that too using military grade AES-256-CBC encryption. Superfast Servers: Servers and IP addresses are maintained in 100+ server locations worldwide to provide seamless and fast internet access. Based on the usage, the servers are customizable as to Double VPN, Tor over VPN, Ultrafast TV (for video streaming), Anti DDoS, SOCKS5 Proxy etc. Lightening Speed: Security provided by NordVPN does not slow down the internet speed significantly. You can still watch your favorite TV shows, movies, videos etc without waiting for them to load or buffer. You can still share and transfer big chunks of data and files at a blazing speed. 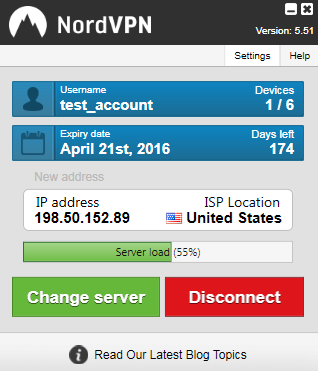 Easiest VPN: NordVPN application is easy to install and use. 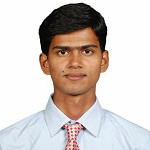 It runs on various platforms and operating systems and has version for the device. No Log Policy: NordVPN never keeps record of the users and provides 100% anonymous internet surfing. It sends encrypted traffic over Tor network which further make convoluted trips around the world to reach the destination, making it impossible to track the source. Automatic kill switch: it helps to protect the applications in case connection drops out. All you need to do is to set the applications to kill switch that needs more security in case VPN problem occurs. DNS Leak Resolver: sometimes DNS leaks queries that are unencrypted and may grab attention of potential hackers. But you are safe with NordVPN as there are no such leaks and you are way more secured and protected. Multiple Device Support: With NordVPN service you can connect upto 6 devices simultaneously. That means, you can now access the internet anonymously from your home desktop, mobile device as well as from office laptop at the same time. Support: NordVPN provides24x7 customer support with FAQ, tutorials, live chat and emails. P2P: while the P2P is not liked by several governments or providers, NordVPN takes utmost care to provide best quality games, videos and music to their users at lightening fast speed. Bitcoin Acceptance: NordVPN is the only VPN service provider that accepts Bitcoin which is the most popular crypto-currency of the world. So, with NordVPN even your account purchase stays anonymous. NordVPN has 100+ servers located across the globe, in 27 different countries like: US, Canada, UK, Russia, Netherlands, Poland, Sweden, Brazil, South Africa, Switzerland, Germany, Spain, France, Italy, Romania etc. You can select a country to view server location, sever address and server load. Selecting the server types helps you to choose between PPTP, L2TP, OpenVPN TCP, OpenVPN UDP and Proxy server connections. With the NordVPN affiliate program, you can earn upto 100% sale commission. Even the best affiliates receive bonuses. You can also refer it to a friend to earn money. By referring to a friend, both receives 20% of the purchase price as NordVPN credit which can be used further to renew or customize the plan of NordVPN service. NordVPN provides various plans according to which prices vary. 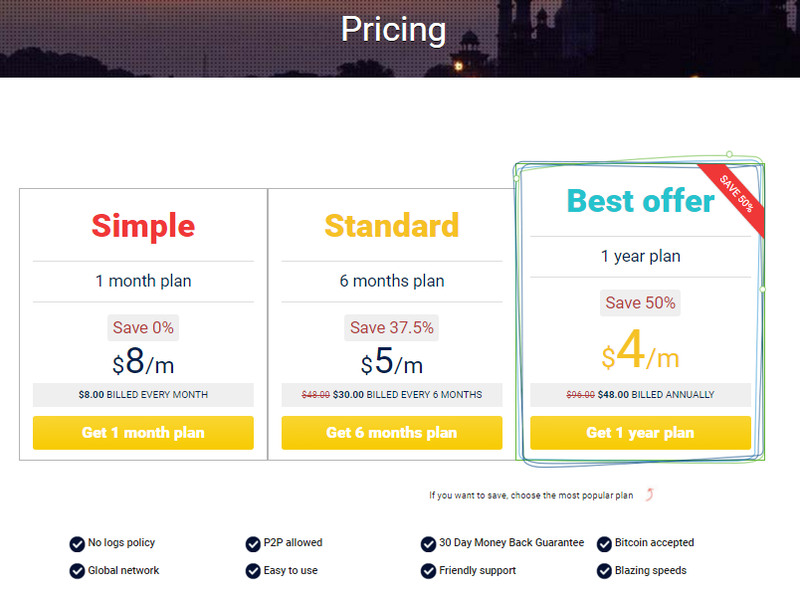 Simple 1 month plan starts at $8/m, 6 months Standard plan at $5/m and 12 months Best Offer plan $4/m. With the offers provided by NordVPN, you can save a few bucks if you make your decision wisely. With 108 servers at 80+ network locations across 27 countries, NordVPN service provides fast anonymous internet browsing to the users by assigning them different IP addresses so that they can browse the contents, share important information or view restricted contents anonymously yet safely and securely maintain their privacy. NordVPN uses 2048 bit encryption which is rarely to be provided by any other VPN service provider. It also categorizes severs types based on the user needs as Double VPN, Tor over VPN, Dedicated and Standard VPN servers, ultra fast TV etc. It uses automatic kill switch and is the only VPN service provider that accepts Bitcoin. It maintains the fast lightening speed and avoids any DNS query information leak. You can visit https://nordvpn.com/ to view the appropriate plan and purchase one to start using the service.